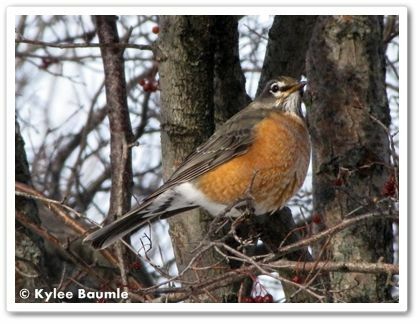 Here in Ohio, we have robins that migrate and those that don't. They're a hardy bird and if they can find a food source, they'll hang around for the winter. It's for this reason that they aren't a true harbinger of spring in our area. The red-winged blackbirds have the corner on that title. We have several Washington hawthorn (Crataegus phaenopyrum) trees on our property and in the winter, they're loaded with clusters of bright red berries. 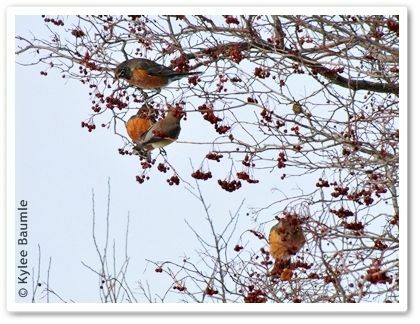 Birds of all kinds like these berries and by spring, most of them have been stripped from the trees by the birds. On Monday, just hours before Part One of "The Big One" began - the snowstorm that was predicted to be the biggest of the season so far and the most widespread - a flock of robins settled in the hawthorn tree in front of our house. They were quite noisy as they settled in and munched their way through the berries on the tree. It wasn't until I came back into the house after a mini photo session and brought up the photos on the computer that I realized there were cedar waxwings dining with the robins! 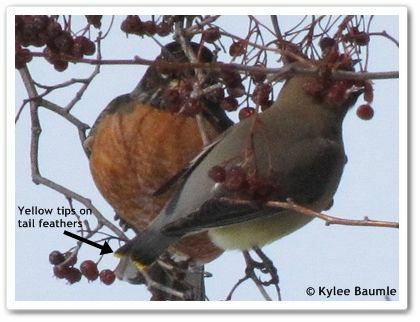 A robin and a cedar waxwing share berries. I couldn't help wondering if they somehow knew of the impending storm and were getting while the getting was good. Perhaps this was the avian version of rushing to the store for milk, bread, and eggs. Awesome photos, Kylee! I especially love the upside down Robin. It's amazing how they can contort themselves to collect every last berry. And the Cedar Waxwing must have been a lovely surprise! What lovely photos you got of the Robins. I hope they have enough to eat. Lisa ~ Raging blizzard out there right now! 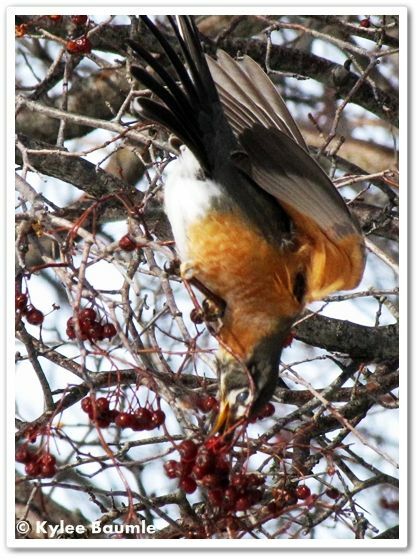 The birds were back today, chowing down on those berries again! Carole Thanks, Carole! I love that one too! And you bet I was thrilled to find that cedar waxwing there! Shady Gardener ~ Don't you wonder what makes some stay and others go? Darla ~ Thanks, Darla! And I agree - God's creatures are so intuitive. We are too, but so many times we ignore that part of our being. meemsnyc ~ Thanks! I hope so, too. We've got many of these trees in our yard alone, so I think they will. We have several feeders, too. Hi Kylee. 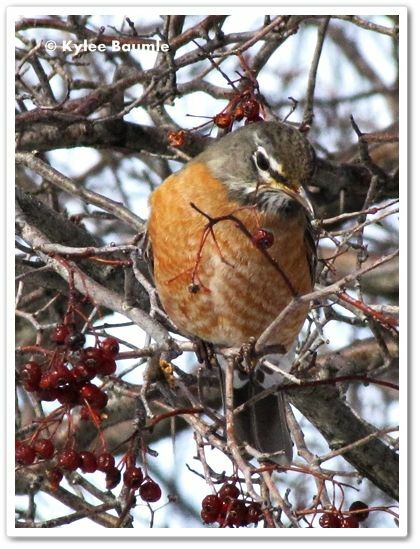 We do not have very many Robins that stay here near my home in the winter. So I was surprised when I saw the field full of them the other day.Maybe they are moving in here because there is snow covering in other areas. They have been getting more snow to the south of us here all winter.They do love your Hawthorn trees. Lona ~ Really? I'd think you'd be more likely to see them there than we would here! Yes, they're always around during the winter. Usually not just one or two though - they're usually in a flock. They were on the honeysuckle trellis this morning, eating those berries. Got tired of the red ones, though they'd have some black ones today. LOL. I have seen more robins here his year than ever before, huge flocks of them! They like the berries on my Bradford pear tree. Sadly it has already been picked clean.